Reservations: Space is limited, call Lauren at 925-284-4474 ext. 134 to reserve your spot! Led by Jan in the Atrium, join us for this hands-on workshop with the most gorgeous takeaway – a primped pumpkin! 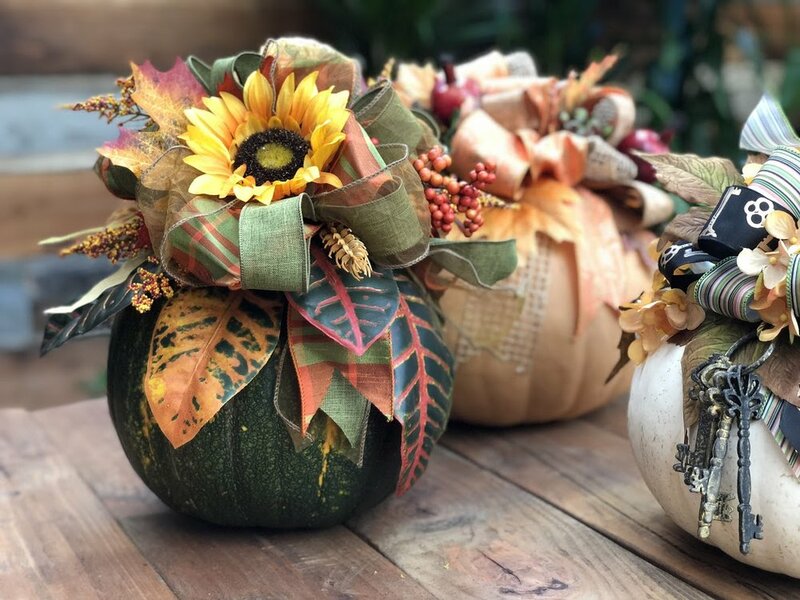 We’ll be choosing pumpkins from the nursery and adorning them with ribbon and everlasting botanicals for a show stopping fall centerpiece perfect for this month’s festivities and your Thanksgiving feast! Here’s a few gorgeous examples Jan whipped up for us…they definitely make amazing hostess gifts! PLEASE NOTE: Unfortunately due to material costs and the popularity of the class, cancellations after October 19th cannot be refunded.